How To STOP FIGHTING The Changes In Your Life, And Transform The Chaos, Catastrophe And Overwhelm Into New Possibilities For Growth And New Beginnings. The live webinar has passed, but fill in your details below to get a link to the replay, available for 7 days. Your friends change your lunch plans…it NEVER stops. I know it sounds alarming, but it’s true. Change is ALWAYS happening, and you can’t always plan for it. But what you can do…what you MUST do if you’re going to live a life of happiness and contentment…is learn HOW TO HANDLE the change that comes your way. You don’t have to be a spiritual leader, best-selling author or “guru” to deal well with change. All you need is a subtle shift in perspective and a little training…but unfortunately, most people never recognize this, and thus most people resist, fight and are overcome by change. You don’t have to be one of those people. You can start dealing well with change NOW, and handle life’s everyday transitions with grace and ease…which sure beats the alternative. After all, when you let change bowl you over, you not only have to eventually deal with the change, but also have to deal with the effects of YOUR STRESS from the change…which can sometimes extend far beyond your own life, and into the lives of others. You see, change, however it arrives, does not have to be ALL bad. In fact, change is often provides for exciting new possibilities and new opportunities. Sometimes things fall apart so that other things can fall together. Once you choose to flow graciously through the various phases of change, you begin to simply “experience” each step, leading to contentment, rather than resistance, fighting and stress. Fortunately, there are simple strategies that exist to help you embrace these new beginnings and move through the process of change with much more peace and calmness. There are many internal processes, often overlooked when major (or minor) change occurs. By dealing directly with these “inner workings,” you can greatly improve your chances of success in times of transition. Think of Navigating Transitions After Loss: Thriving in the Midst of Change as a complete “systems upgrade” that will leave you re-programmed and better able to handle life’s little (and big) ups and downs. We will examine how you commonly react to change, and explore a variety of empowering alternatives. You would never experience any kind of change if it wasn’t vital to your very existence. During the call, you will realize why change is so necessary to your life. Even though the experience of change can be difficult at times, the results are often extremely positive. With a few simple shifts, you can adopt an exciting new perspective on change. Change has the power to show us just how possible it is for you to have a richer, vastly more fulfilling life…if you can accept it. Utilizing powerful secrets and technologies, you will come to a deep, relaxing place of acceptance around your ever-present life transitions. As I said, this is a power-packed, content rich webinar, and it’s full of insights, inspirations and tools that you’ll use for the rest of your life. OH, and one more thing…IT’S F*REE*. That’s right…this entire training is yours to attend absolutely FREE, as my gift to you. Don’t waste another second stressing out from change. You have far more important things to concern yourself with, and the people around you are counting on you to be the calm, composed center of their world. Register NOW, before you miss out on another moment of peace. 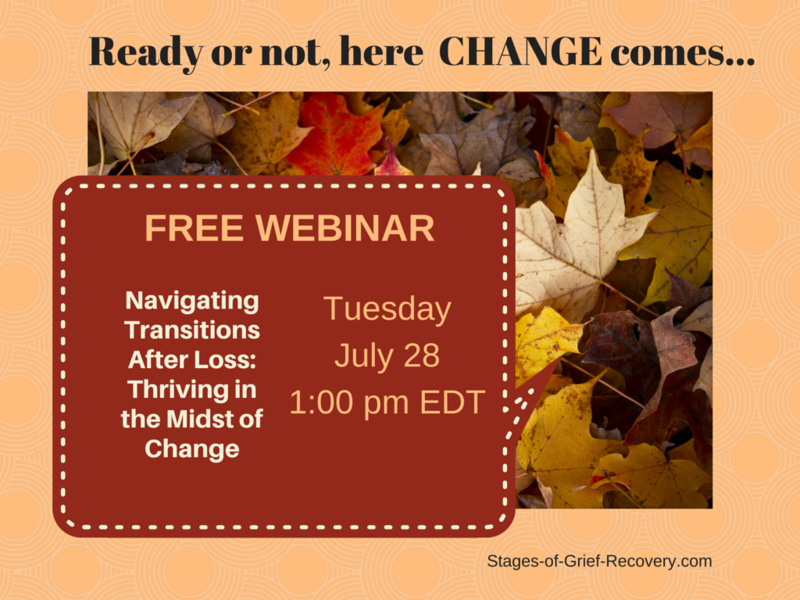 Helping you transform grief into renewed purpose and personal growth. Debbra Bronstad, The Break Through Grief Coach and author of the forthcoming book, Break Through Grief: 8 Strategies for Dealing with Life's Many Losses. After experiencing a series of painful losses, Debbra began researching how to recover after loss. Disappointed that so many grief groups and most grief therapy only provide an opportunity to express the painful and confusing feelings about loss, Debbra created a program that takes you to the other side of grief. Debbra is passionate about helping individuals, families and couples experience greater peace, hope and joy in the midst of the conflicts and trials of life. Debbra helps you transform grief into renewed purpose and personal growth.